Advanced security, logging and configuration features highlight release of Server Technology’s firmware version 5.3e for Sentry™ Smart and Switched Cabinet Power Distribution Units (CDU’s). Server Technology is pleased to announce the release of the new firmware version 5.3e for Sentry™ Smart and Switched Cabinet Power Distribution Units (CDU’s). New features include logging capabilities, upload and download configuration options via internal FTP server, strong PW support, the ability to disable the external reset button, and additional user password capabilities just to highlight a few of the new key items offered. The web based Sentry user interface is by far the most secure and feature rich GUI offered for any CDU product family with multiple interface and alarm options including: Telnet, SSH, HTTP, SSL, Serial interface, FTP, SNTP, SNMP, LDAP and TACACS+. 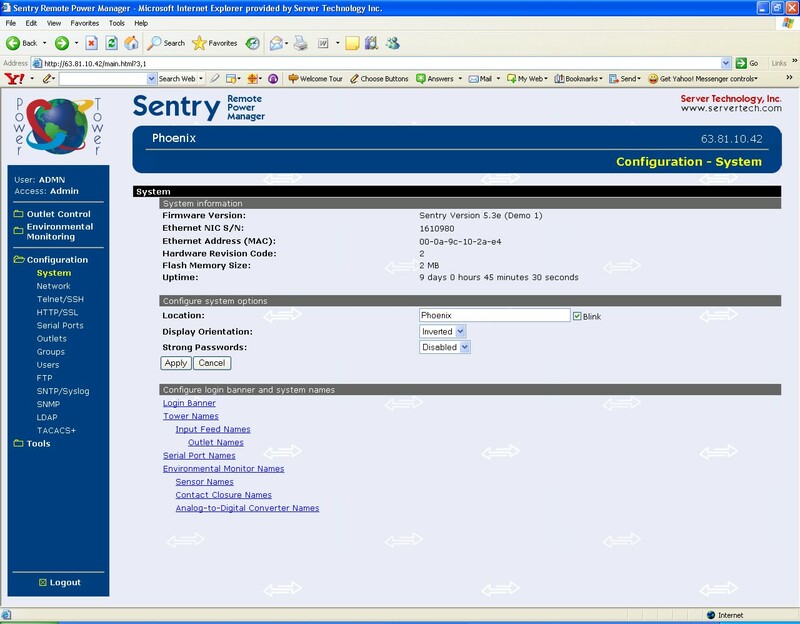 This GUI is integral to the Sentry design and is accessed via the web by device IP address or for managing large numbers of units through our Enterprise View system which includes the ability to auto-discover each CDU device. The new logging feature in the 5.3e firmware includes logging of all authentications, configuration changes and system events. Each log entry includes a sequential log entry number, date/time stamp, and a text message. The new upload and down load configuration tool, via internal FTP server, allows for the same configuration to be uploaded to multiple products creating significant time and labor savings when installing and configuring multiple power distribution devices. The Sentry family of Cabinet Power Distribution Units (CDU’s) includes Basic, Metered, Smart, Switched, Fail Safe Transfer Switches as well as a complete line of -48 VDC products. NOTE TO EDITORS: For more information or for high-resolution images of Server Technology’s new firmware version 5.3e for Sentry™ Smart and Switched Cabinet Power Distribution Units (CDU’s), please contact Calvin Nicholson.